Born: December 30, 1861 in Falmouth Ma. Died: March 27, 1932 in Bourne Ma. at 71 yrs, 1 mo. Where Lived: Scraggy Neck Rd. in Cataumet Ma. 1. Annie Carlton Landers Church; (July 18, 1888 – December 1963); Married Herbert Ransom Church (1891 – 1972) (George Ransom Church & Capitola Jessie Robbins) in Cataumet Ma. on March 18, 1914; Annie & their daughter Muriel C. Morrill are buried in Cataumet Cemetery; Herbert is buried with his family in Hancock Village Cemetery in Hancock Vt..
2. 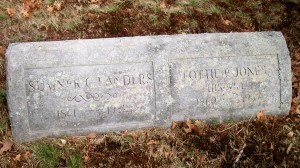 Ella M. Landers Jones; (October 24, 1892 – ? ); Married Allen Munroe Jones (1895 – ?) (William David Jones & Mabel Frances Besse) in Cataumet Ma. on September 28, 1914. 4. Elmer Watson Landers; (October 15, 1895 – August 13, 1979); Married Helen B. Hundley (1906 – 1988) (William Edward Hundley & Florence Electra Flagg) on April 10, 1927; Elmer & Helen had 3 children & lived at Mystery Lane in Cataumet Ma. ; They are buried in Cataumet Cemetery. 5. Gladys Louise Landers Jones; (December 10, 1897 – October 8, 1991); Married Albert Sturgis Jones, WW l (1899 – 1968) (William David Jones & Mabel Frances Besse) in Cataumet Ma. on April 2, 1921; They lived in Wareham Ma. & are both buried in Centre Cemetery in Wareham.